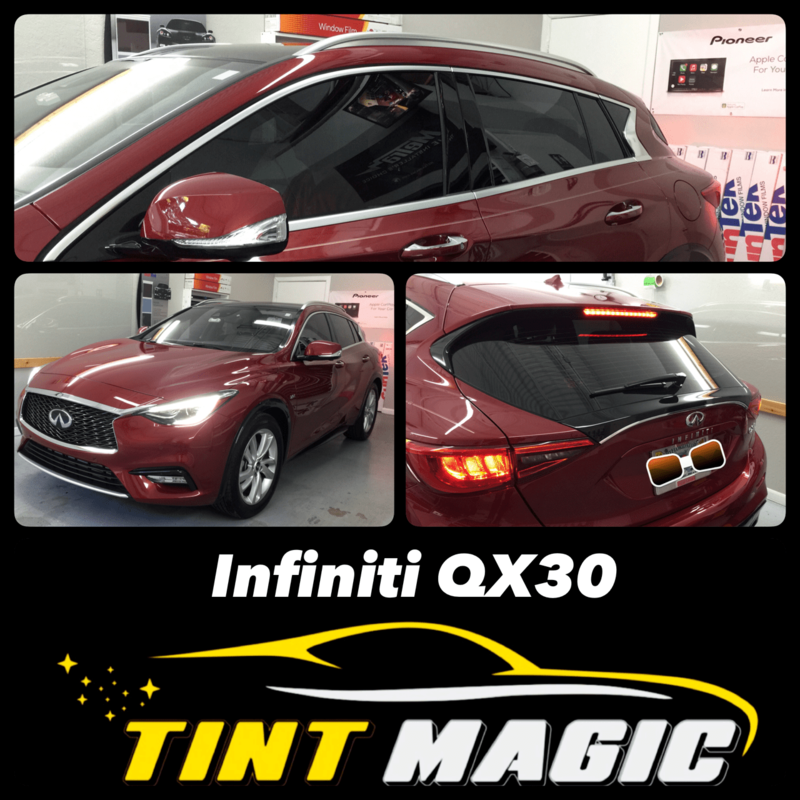 Infiniti QX30 at Tint Magic Window Tinting Coral Springs. Call us for the best quality and service! (954)840-7883. We are located at 11344 Wiles Road, Coral Springs, Fl 33076. Crossovers continue to crowd showrooms across the nation, but few have styling as distinctive as the QX30’s. A sweeping roofline and a high beltline make the cabin feel small and outward visibility seem compromised—that’s the price for fashion. A 208-hp 2.0-liter turbo four-cylinder drives the front or all four wheels through a seven-speed automatic. A well-appointed, attractive cabin features a 7.0-inch infotainment touchscreen; a firm suspension offers fun when the road turns twisty. The Sport label encompasses more than just spoilers and fancy wheels, as well it ought to for its hefty $8550 upcharge over the entry-level model. It gets the same 208 horsepower from the same turbocharged 2.0-liter inline-four as other QX30 models (and GLA250s), but our front-wheel-drive Sport weighed nearly 200 pounds less than the all-wheel-drive edition that underwhelmed in the comparo. It also rides 0.8-inch closer to earth than the base front-drive version. That lowers the center of gravity enough to make it feel more like a hot hatchback than a shrunken SUV. Wheels grow from 18 to 19 inches in diameter and are shod with more aggressive Goodyear run-flat performance tires versus the AWD model’s all-season rubber. As in all QX30s, the transmission is a seven-speed dual-clutch automatic. While none of the Sport model’s cosmetic touches nor its aggressively contoured sport seats make it a better performer, each adds a measure of engagement to the experiences of approaching, entering, and interacting with the car. It’s a different animal.